On January 10, 2019, the now infamous president of Venezuela, Nicolas Maduro, was challenged by the nation’s National Assembly when they declared Juan Guaido as interim president. 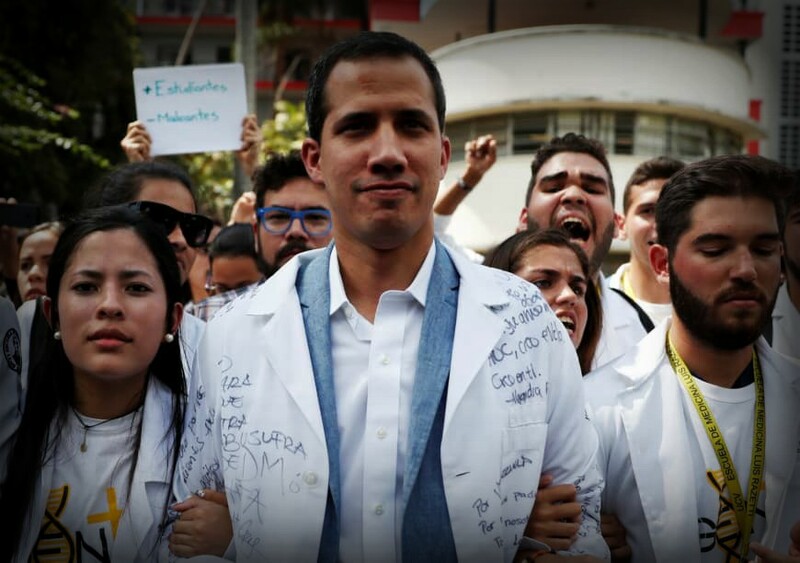 Guaido castigated Maduro, branding him a dictator and asserts that his centralization of power and mismanagement of the economy amounts to a dereliction of duty. On January 23 Guiado himself declared himself the interim president of the struggling Latin American nation and formally assumed executive authority from then on . Guiado, in conjunction with the National Assembly, has condemned the elections of 2018 as illegitimate due to the restriction of many opposition parties from participating. The international community has quickly marshaled support for the potential new president of the nation in the hopes that his egalitarian and liberal sensibilities will bring greater stability to the nation and subsequently the region. Venezuela has been in economic turmoil since the 2008 financial crisis which culminated into a full-blown depression in 2013 and has maintained the top spot on the misery index through 2017. As of 2018 unemployment was over 30%, public debt comprised over 30%, and a 1,698,488% inflation rate creating massive shortages in food and other essential goods. The current state of the nation has gained the concern of major powers which are calling for Maduro to resign and the prospect of foreign military intervention has been discussed by multiple media sources. With the military still backing Maduro, this crisis may soon reach a boiling point. In predictable fashion, the globe is divided along ideological lines in their support for one president over the other. Authoritarian nations such as China, Russia, Cuba, and Turkey have backed Maduro while more liberal nations such as most of western Europe, Australia, Canada, and the U.S. back Guiado. Additionally, neighboring nations of Colombia, Brazil and Central American nations of Guatemala and Honduras that are being negatively impacted by the rapidly deteriorating economy have also shown their support for Guaido . The vendetta here is Maduro vs. Guaido with the future of Venezuela hanging in the balance. Since Maduro took office, his primary focus has been solidifying his grip on the government and the economy which many have blamed for the current catastrophe. In the early 2000s Venezuela received an economic stimulus when oil prices rose. Chavez took this opportunity to capitalize on his administration’s popularity by reforming the nation’s constitution to give him control of all three branches of government and a supportive majority within the National Assembly. He implemented his economic agenda, the “Bolivarian missions”,  which are a series of social programs that would provide government subsidies for education, general welfare, nutrition, healthcare, housing, etc. In the year 2000 Maduro’s government spent more than it earned and maintained that pattern for the next decade. In 2003, through his Mission Mercal, he introduced a state-owned grocery chain that sold goods below market rate and only purchased items for domestic producers. Soon after, Maduro introduced price controls and nationalized certain industries which swiftly resulted in shortages and hoarding. Following the 2008 financial crisis, the reduction of oil prices, imports, and exports greatly inhibited the nation’s economic viability. Upon Maduro’s inauguration, the economy’s inflation rates began to soar from 69% in 2014 to 1,698,488% in 2018. Much like his predecessor, Maduro’s government focused on centralizing its own power and failing to adjust to the new reality of a failing economy. With the military machine still backing Maduro, wresting the government from his grip may still be a Herculean task even with international support. Military intervention, especially from the United States,  would only degrade the region further, precipitate an international incident, wreak havoc on an already beleaguered populace, and create a western Vietnam. If Venezuela is ever going to return to its previous trajectory of growth, the state is going to have to minimize its control over resources. If Venezuela is going to recover, whoever takes control of the government in the coming months will need to allow for foreign aid and investment to stimulate growth for the nation’s economy. The state-run oil firm PDVSA has been the primary source of revenue for the country and Maduro, competition is a critical part of economic development and the next government should work to prevent state-sponsored monopoly. Releasing state controls on all sectors of government and reducing barriers to foreign investors to diversify products and services that can be exported into the international marketplace will be crucial in encouraging growth. Next, the influx of foreign capital should be issued to applicants in the form of micro-grants or loans that can present a workable business plan to contribute to entrepreneurship and, in turn, private sector growth, specialization, and consumer spending. Lastly, the new constitution needs to separate the executive from the other three branches entirely and removes its ability to alter them ad infinitum. The primary impediment for developing nations is having an executive that has unabated access to national resources, this results in uninformed and often wasteful decisions that reinforced inequality. The executive should also be prohibited from any involvement in the tabulation of votes and the creation of electoral protocols. Venezuela has been plagued by elections with little to no integrity which creates a monopoly on governance, to ensure a prosperous Venezuela popular sovereignty must be protected. David Williams is a Los Angeles native who holds a Bachelor of Arts degree in Political Science from University of California, Santa Cruz. He has been interested in politics since his early childhood. During his undergraduate studies, he was a chief campaign intern for the Santa Cruz City School Board. He has undertaken independent studies in issues such as homelessness and university-level crime (bullying, etc.). His key areas of interest are: Higher Education, domestic legal policy, and Middle Class advocacy. He is a firm believer in a proper people representation and governmental accountability, and aspires to run for public office one day. He believes objectivity is paramount in productive political dialogues, and he hopes to bring that as a Policy Corner Writer for PVNN Inc.